The economy swings up and down as measured by various indexes and it needs to, because how else will the billionaires make more billions if the market was stagnant and just slowly growing....this is Market 101 here folks, nothing you shouldn't have learned at prep school. Anyway, as the market swings up and down, so does the price of gasoline...and consequently so does the price of fuel sipping used cars. A few years ago when gas was $5/gallon, you could sell a 2 year old Prius for more than MSRP, but today fuel prices are low so now is the best time to pick up some oddball classic from the 80s that gets great mileage. 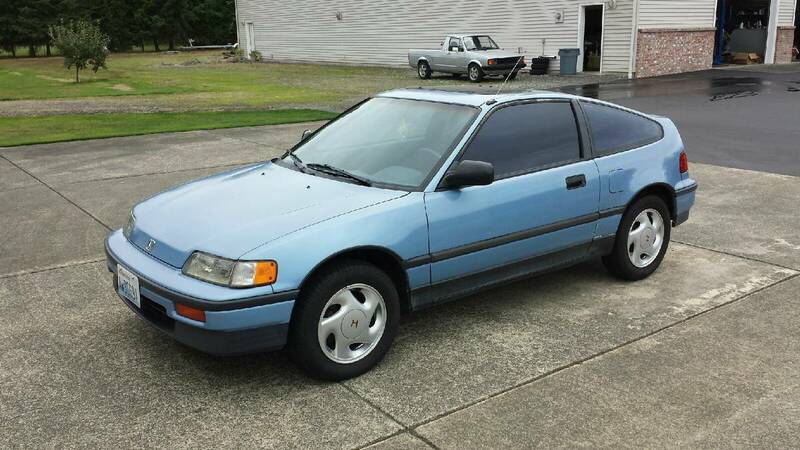 Find this 1988 Honda CRX HF offered for $2,900 in Seattle, WA via craigslist. Tip from FuelTruck. Honda launched their second generation CRX in 1988. It used the same basic formula of the previous generation, but with updated looks/goodies. Curb weight was low (1800 lbs), engines were small, and gearing was long...particularly in the HF (High Fuel-efficiency) version that we see here today. 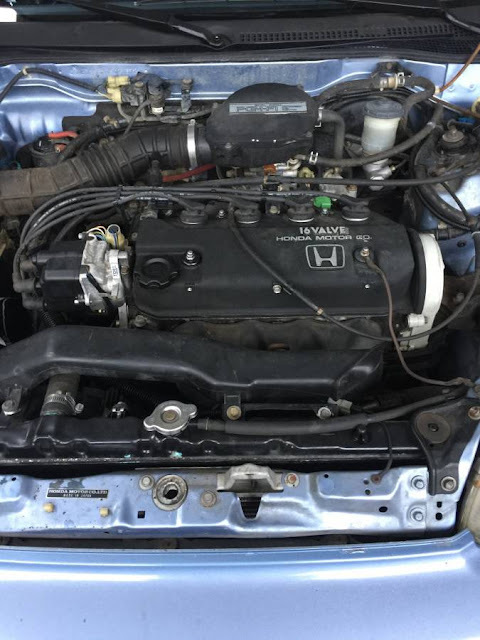 The HF was powered by Honda's D15B6 inline-4 that pushes a meager 62 horsepower from its 16-valve head and into a 5-speed manual (no slushbox allowed in the HF). According to the EPA, this little two-seater will return 49 mpg highway and 41 mpg city -- not bad at all when you consider it has no hybrid system and was designed in the late 70s/early 80s. 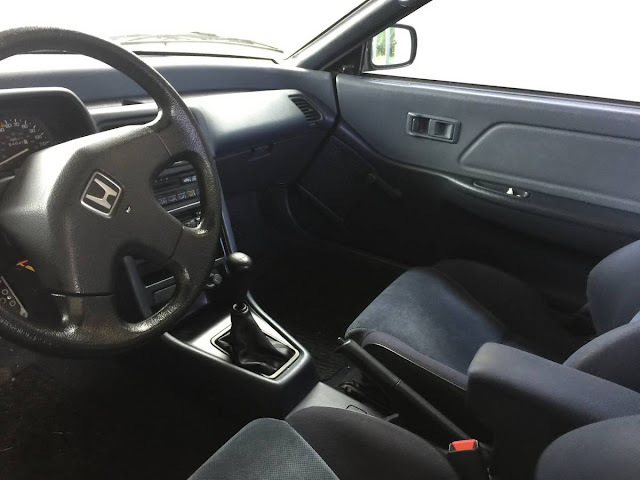 Pretty sure the wheels and steering wheel are not original to the HF model -- should be 13" steel wheels and two-spoke steering wheel. Also, the HF did not come with a factory sunroof, so that may be a dealer-installed or aftermarket sunroof. 40mpg is a hint that this may be running as a DX and since the wire harness and other stuff may be unique on the HF, this may just be a DX all around. I had an HF for a few years and it was a 52+mpg slow super slow kinda thing but it sure saved me a TON of money! This is among the best deals I have seen. These cars are tineeeeee given the lumbering blobby SUV's and other such inane POS. The roof of my Mini Cooper lines up with the bottom of the side windows of a Tahoe, and lining the front bumpers up my rear bumper lines up in the middle of the truck's rear door. This car may well be even smaller. I would love the relatively elemental and connected feel of this. Cheap as chips. I just sold on my daughter's 2007 Civic with 275K and truly never a mechanical issue. Remarkable.